This weekend, make the best of a bad situation. 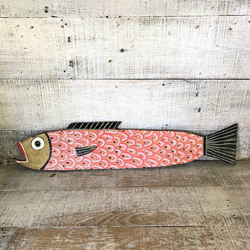 After Hurricane Irma, yzzilnoaj collected up pieces of destroyed fence posts, and with the help of her hubby, who cut them out, made whimsical fish for friends and loved ones who survived the hurricane with them. Each fish has a unique personality. What fun!